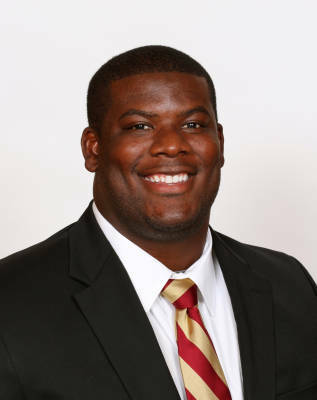 Joined fellow senior Jacobbi McDaniel as back-ups along the Seminole defense front four…played in 11 games and made one start versus Bethune-Cookman at LE…finished with 22 tackles, 1.0 tackles for loss and two quarterback hurries…made four tackles and was credited with a QB hurry against Nevada…had a tackle in his first career start against Bethune-Cookman…registered four tackles and added a pass break-up at Boston College…posted four tackles at Wake Forest…two tackles and 1.0 TFL against Syracuse…helped Florida State’s defense lead the nation in scoring defense (12.1 ppg) and ranked third in total defense (281.4 ypg)…participated in the East-West Shrine Game. Played in 13 games providing depth on the interior of the vaunted FSU defensive front…finished third on the team in sacks behind only consensus All-American Bjoern Werner and honorable mention All-American Cornelius Carradine…seventh on the team in tackles for loss…4.5 of his five TFL came in the last five games…recorded four tackles, a forced fumble, a sack and 1.5 TFL in the Seminoles big Thursday night road win at Virginia Tech…set a career high for tackles with five versus Clemson and then matched that total in each of the last two games versus Florida and in the ACC Championship Game versus Georgia Tech…nearly half of his tackles (16) have come in the last five games of the season…sacks came versus BC and then in back-to-back games against Virginia Tech and Maryland, as well as in the Orange Bowl against Northern Illinois. Redshirt sophomore defensive tackle who played in all 13 games…also saw action along the offensive line on special teams…limited by injuries early on this season, but played a more prominent role down the stretch…tallied five tackles on the season, including three solo stops. A redshirt freshman who was a valuable member of the defensive tackle rotation in his first season…appeared in 12 games in a reserve role…made the most of limited playing time, registering 16 tackles, including seven tackles for loss, which ranked third on the team…also credited with three quarterback sacks…posted a career-high four tackles and a pass breakup at Virginia…twice notched two tackles for loss in a game (Oklahoma, Virginia)…had 1.5 sacks against Samford in his collegiate debut…did not play against North Carolina and Maryland…named fifth-team Freshman All-America by Phil Steele, CFN Freshman All-American Honorable Mention and Rivals.com All-ACC Freshman Team. Suffered a knee sprain early in preseason practice, leading to a redshirt season. Played defensive end at Alonso High School, where he earned a four-star rating…selected to play in the Under Armour All-American game…in two seasons recorded nearly 50 tackles for loss and 30 sacks…earned MVP honors for his performance in the Hillsborough County East vs. West All-Star game after recording two sacks…outstanding athlete who played basketball as a junior…the oldest of four children raised by his mother Katina Daniels…received 27 scholarship offers and chose FSU over Georgia, USC, Miami, Florida, Tennessee, Auburn and Clemson…born February 23, 1990.